Fiore Sardo DOP- Whole Wheel (7 pound) by igourmet at Smokey Robinson Foods. Hurry! Limited time offer. Offer valid only while supplies last. Sheep are very important to Sardinia, the island north of Sicily off the Italian coast. The landscape there is dotted with sheep everywhere you look. Sheep are very important to Sardinia, the island north of Sicily off the Italian coast. The landscape there is dotted with sheep everywhere you look. In fact, Sardinians have been tending sheep since the beginning of recorded history (about 1000 BC). The sheep found on Sardinia are from ancient stock and live in the wild. It is these wild sheep that produce the milk for Fiore Sardo. The result of a laborious, complex cheesemaking process, Fiore Sardo is a straw-colored cheese with a brown rind. The Italian word fiore means flower. Thus this cheese is named the "Flower of Sardinia." 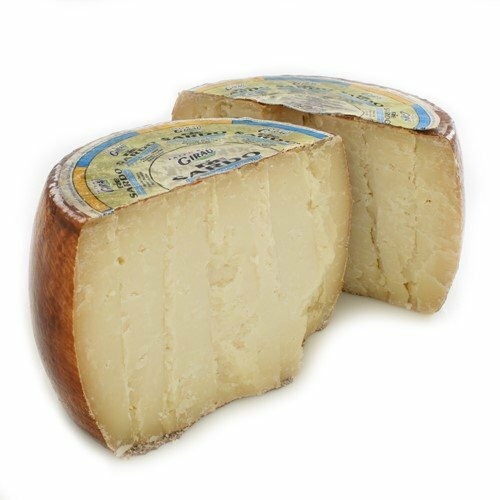 A bit more forceful than Pecorino Toscano, a famous sheep's milk cheese from Tuscany, this Sardinian pecorino has a slightly salty flavor and a long finish. Ours is aged for three months and is perfect served as a table cheese. This is a protected DOP cheese. Made from unpasteurized sheep's milk. Photo depicts half of 7 lb. wheel.